Last week I had the privilege of hanging out with about 50 fellow demonstrators at a team meeting that lasted the whole weekend. I absolutely love these gatherings. Least of all because I also get to swap projects with these talented people! I got so many wonderful projects and ideas from these girls, but I thought you might to see the swap project I made to give them! This blue one is the version that I actually swapped. But I did make two to start off with. The other one is pink!! I know that sounds a bit odd for a landscape type card, but it does work! I am totally in love with the Wonderland stamp set in the Holiday Catalogue. 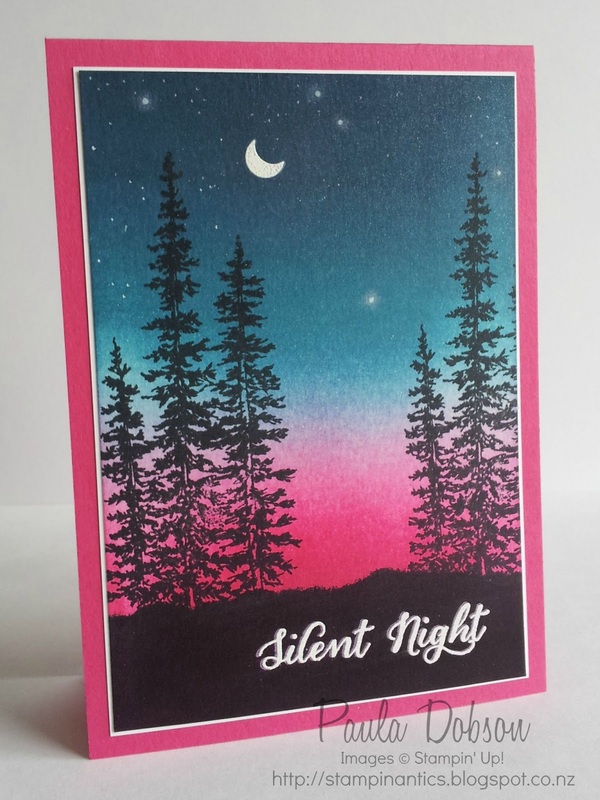 The trees are just wonderful and lend themselves to a landscape card beautifully. I would love to hear which card is your favourite! They are both beautiful! The pink one reminds me of the old saying, "Red sky at night, sailor's delight". You are so right Barb! It's going to be a lovely day tomorrow then! These cards are stunning. Thanks for sharing. Paula, there's no way I can pick a favorite...I love them both equally! I love this stamp set too, and you are always an inspiration to me, to get going on sponging. I love sponging and need to do more of it. Love these cards....both of them. 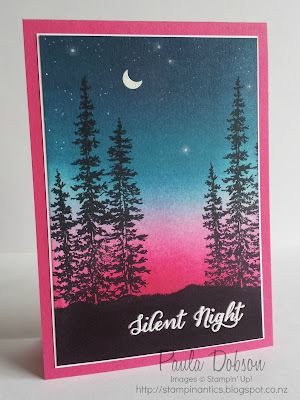 How did you make the stars and that cute moon? White embossing? Thank you for your kind words Bobbi. The Moon is white embossed for sure. That stars are done with a white gel pen and then dabbed gently with white craft ink to get the halo. Spectacular cards. Love them both. This is truly a fabulous stamp set for this Christmas. I have one question…how did you create the bottom black layer? 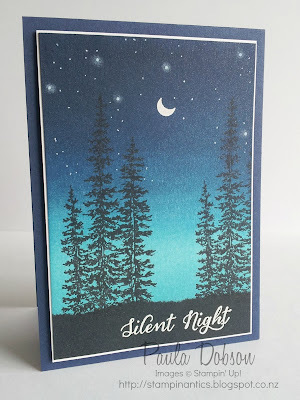 Did you use torn paper or brayer that black as well. It looks sort of distressed on the top edge, which gives it a more real look. Thanks for the creativity. Thank you for your kind comments Maureen. You figured out the bottom layered perfectly. Tear the edge of a post-it-note, lay over my work and brayer over the black ink. The torn edge does give it a more realistic look, absolutely!